Teams from businesses around the city dressed up and joined the adult spelling bee fundraiser to support Monroe County Public Schools. Cheering, laughter and clapping were all part of this year’s Great Grown Up Spelling Bee contest. Participants not only had to spell tough words, but they also had the opportunity to showcase their spirit as a team or as a supporter of the event. 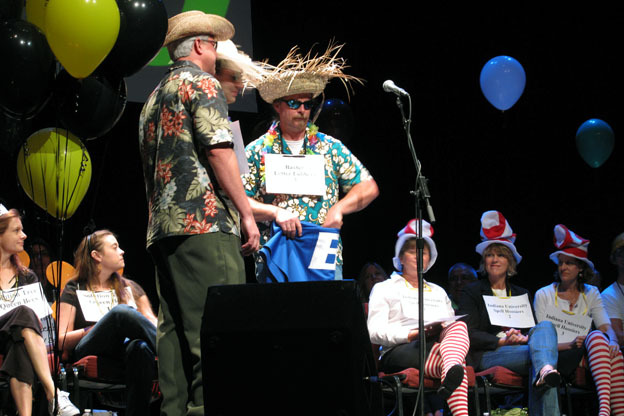 This is the event’s second year, and while new words, new spellers and new costumes were introduced, they were all buzzing for education to help support public schools in Monroe County. But when it’s spelling time, Monroe County Community Schools Executive Director Sara Neeley, says all 11 teams have their game face on. The WTIU Super Grovers took home the trophy this year. The spirit award went to the Cook Carpenters, and the award for the best costume went to the Solution Tree Queen Bees.